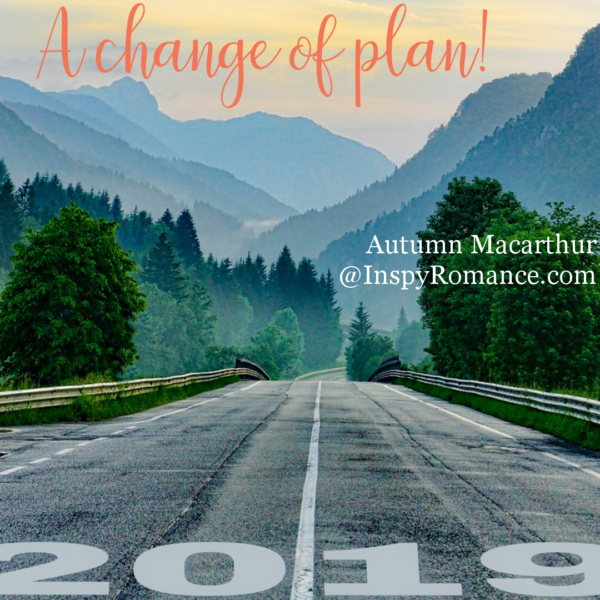 A change of plan, and why I have my word for 2019 already! Nearly 2019? Surely not! We just had New Year, didn’t we? It can’t possibly be fall. I didn’t finish writing my summer book yet! Uh, it appears it really is the middle of October. 2019 is just 10 or 11 weeks away. Oops! Life, and God, can have a funny way of changing our plans! I have a dear friend who doesn’t like me to use the word “plan”, even though I try to remember to add “God willing”, every time I say it. And I think she’s right! “Hopes” is a far better word. I had so many plans for 2018, for both writing, and for life. Flaky confession alert here – my plans vs the reality! I had oh-so-good intentions to write and release six books in 2018. LOL, that didn’t exactly work out! By May I was already way behind, with messy results. The La Risposta (A Tuscan Legacy #9) launch was delayed a month, and Heart in Hiding (Love in Store # 6) got postponed till 2019. My Christmas book – dropped till Christmas 20-who-knows-what! I figured I could still get some of the other books I had planned for the year done. Huckleberry Lake #4, Choose Again, for a late-summer over-60s boxed set. And Brodie’s story for The Macleans could get pushed back to a January launch instead of December, if needed. I’m still hoping Brodie will get his story told at last this winter. He’s had a long wait! But Choose Again, my over-60s romance for the Somewhere Beyond the Blue set, stubbornly refused to come together. Nine chapters written, and it stalled. No matter how much I pushed, pleaded, and cajoled these characters, the rest of the story just wasn’t coming. Usually that’s a sign the story took a wrong turn somewhere. Often somewhere early. Three weeks before deadline is not a good time to realise my story probably has a major flaw. Especially when I have zero clue what it is! After much prayer, I knew my only choice was to regretfully drop out of the set rather than delay the launch. The set (delayed a couple of weeks for other reasons, as it turned out) released this week, with some wonderful stories you won’t want to miss! So with Choose Again laid to rest in the Graveyard of Unfinished Books, I hope only temporarily, I felt pretty much the flakiest person on the planet. So far, only one book out of all I hoped to complete in 2018 actually done on time. I started to listen to those nasty little whispers of negativity telling me life would be so much easier if I just gave up writing. Not great timing, when with Marion Ueckermann, Alexa Verde, and lovely blogger Paula Marie, we’d just set up a Facebook reader group, Three Authors and a Blogger! But those whispers persisted, and got louder. Thankfully, God whispered even louder, telling me He wasn’t finished with me yet! He reminded me that my word for 2018 is “still”, and while I’d been busy making my plans and trying to make them happen, I’d neglected truly being still with Him. Oh, I prayed and read my Bible, but I wasn’t still. He reminded me of His priorities for my life. Time with Him, getting a better sense of the physically, emotionally, and spiritually healthier habits He’s asking that I let Him grow in me. Ones that will help me serve Him better and support what I feel called to do – nurturing my husband, nurturing friends and family, giving to readers, writing the books He gives me to write, helping readers find them. So here is is mid-October, and He’s already given me my word for 2019. “Discipline”. The discipline to be still with Him, to soak in His love and grace. And then the discipline to take that out into every interaction I have with others. The discipline to live in obedience to His plans, not my own! Then He sent me off in a completely unexpected writing direction, both the story I’m working on now and two new projects to add to my to-be-written list. Looks like next year could be even more interesting than I guessed! Did you choose a word for 2018? If you did, how has it applied to your life so far this year? One comment made on this post will be randomly chosen to win an ebook copy of my hope-to-release-it-later-this-month Christmas set, Together for Christmas, containing a book from each of my four main series. Including that unexpected writing project – revising Love’s Healing Touch, my novella last summer for the now-unpublished Kindle Worlds, as a longer Christmas story set in Sweetapple Falls! Aw, I am so so happy you are listening to God and not giving up writing!! We need your stories, Autumn!! I for one am very much looking forward to Meg’s story! I think I need to plan – hope? for a word if my in in 2019! Hope is a wonderful word, Paula. Praying 2019 brings yu all you hope for! And Meg’s story will still happen eventually. I figured out what was wrong with it. LOL, nothing a total rewrite with a new hero won’t fix! Hi Autumn, oh the ways life takes us that we do not plan!! I totally get where you are at! My word for the year changed early in Term One during a staff worship when God reminded me to have Courage- to not be afraid to speak up, stand up, say no…to share who He is with those around me even when it is difficult. Even though I am blessed to teach at a faith based school, the majority of my students do not feel a need for God in their lives; showing the relevance for God is then a challenge. Hi Autumn! Thanks for sharing your year’s journey. I can so identify with the word “still.” During the sandwich years while working full time as pastor’s wife, teaching high school students, and caring for my aging parents, Psalm 46:10 kept me sane. “Be STILL and KNOW that I am GOD.” He is in control of ourLIVES and often inspires our PLANS. We just need to be FLEXIBLE when HE, God Almighty changes them. Personally that is what is challenging. As I age and as a retiree, I now have more room in my calendar and day to be flexible. But when life throws curve balls, as it does, I try to remember the word “STILL,” and take a deep breath and remember who is in control. May God give you peace and inspiration as you continue the year. Blessings. Thank you for your inspiring comment, Renate. Yes, He is is control. And LOL, I’m very glad of that. If I were in control, what I mess things would be! Hi Autumn–I think sometimes we need to go into a “reset” mode. Like you said, focusing on Him, and who He is and who He is to us. I have been in a mode like that for about a year and a half. I have stories percolating in my head, a couple of them already started. They’ll come in good time, in His time, I believe. Your stories will see the page! I know it. I’m glad you’re taking the time you are to seek Him and see what he has. That over 60 boxed set looks like fun! I’m glad you pointed us to that set. Thanks for sharing this part of your life. I didn’t have a word for 2018. We’ll see what 2019 brings. I already have a nudging of a word–one from a couple of years back that I didn’t fully embrace. 2019 may be the year. Hi Lindi! Yep, whatever we do, it must be in His time not our own. And the “word” if we have one, for the year will come from Him. It hasn’t happened yet, but if He didn’t give me one, I hope I remember not to go looking to try to find one on my own. I would surely choose the wrong one! Life certainly does get in the way of our best laid plans. I’m glad you aren’t giving up. I don’t think I had a word for 2018. If I did, I lost it. It does get in the way, Kimberly! I didn’t have a word for 2018, but both your words resonated with me. I strongly need to be still, and exercise self-discipline. I’m glad you’re not giving up on writing. I’ve enjoyed many of your stories, particularly the Huckleberry Lake series. I think we all need both those things, Sherri. maybe some of us more than others (that would be me! ), but we all do need them. I’m grateful and glad you enjoyed the Huckleberry Lake stories. So sorry it will be a long wait for the next one! I’m hoping next spring or summer, but the changes of plan mean neither of the books I intended for this year can now happen. I think my word for 2018 was rest. I didn’t plan on taking a prolonged rest from writing, but I needed it. Writers brains get tired. We have to keep up with our lives and our characters lives. Autumn I totally relate to what you just shared. I love your books and would be very sad if you stopped writing. You are extremely gifted and very real. The more we yield to God’s will & timing for our lives the more peaceful & joy we have. Keep up the good work, your books are such a blessing. Thank you so much, Linda! Your words are a blessing to me! I’m so glad you enjoy my books. Autumn I totally relate to what you just shared. I love your books and would be very sad if you stopped writing. You are extremely gifted and very real. The more we yield to God’s will & timing for our lives the more peace & joy we have. Keep up the good work, your books are such a blessing. I’m not where I want to be either. The praise is I participated in an extra project (A Christmas to Remember) that I did not know about when I set 2018 goals. In some ways, meeting new readers through the set, I feel ahead. The defeated one won’t get me with his lies. I am usually on the lookout for my new word for the next year once fall hits. I have an idea, but not positive. This year is abide. What a beautiful word, Julie. And I’m pleased to see the Inspy Romance Christmas set is doing well, just as it deserves! It’s so important not to listen to the adversary’s lies. I love the way you call him the defeated one. True, and important to remember! he IS defeated. Totally. Completely. 100%. I didn’t have a word for the year. I do have to thank you so much! This really made me realize I need to make changes in my life! I won’t go into too much detail-trying not to write a book here! A few yrs ago I had what I looked at as a new lease on life. I was free to worship how I wanted & give of myself to others as such too. After a while God literally put me on my back. I broke my hip, went in a nursing home temporarily losing my son, home & the ability to move. Within days I also lost my Mom who was my best friend. I knew God had good reason & relied on Him more than ever. Fast forward to now, 4 yrs later. I’m grateful to be home but still am severely limited in mobility, have lost most of my family & watched my church family drift away. I knew I’ve been very discouraged but what you just said made me see that somewhere along the way I’ve not been spending enough time with God & NO time listening to Him!! THANK YOU! I need some serious changing. I know I can’t change others or my circumstances (not my job) but need to concentrate on changing me!!!! Hugs, Deb. Praying for you! I’m sure God will guide you and support you as you make positive changes. I love your word for next year! I think I need it in my life too. As for my word for this year, it was Encourage/Encouragement. Not getting, but giving and I believe it’s been a good year. God has placed in my steps many people who need encouragement and He’s given me the words to say. I feel blessed. I would definitely see you as an encourager, Marylin! Such an appropraite word for you to be given. I do hope you keep writing! I have enjoyed many of your books, and still hope to read the rest. I get snowed under in my TBR list. My word for this year is deeper, and it has really fit this year. I have gone deeper in several things, and been stretched beyond what I thought was possible. And I am deeper in love with our precious Savior, as He has been so gracious & patient with me. He is worth everything! I find my experience usually mirrors my word for the year, Becky. Like you, both in ways I expected and even more often in unexpected challenges! Jesus is so amazing – and growing in lve with Him more and more is the best possible growth, IMO. Prayers for a wonderful 2019! My word for 2019 is yet. I thought it was such a small word, but there is truly large meaning behind the word! God has told me He isn’t finished with me yet as I continue to be in his word and putting it into practice daily. I am getting ready to retire and he has told me the best is yet to come! More time to spend with loved ones and moving His word along. So yet has become a very big word for me if that makes any sense. That makes perfect sense, Pam, and wonderful sense too! I’m very glad for your big “yet”! Hopefully you are doing well now and I’m so happy that you will continue to write, maybe at a slower pace would be good. I have the box set but haven’t started reading it yet. I am much over the age of sixty. God has blessed me greatly over the years. Even now, my health is fair, I’m just limited in what I can do because of serious back and knee issues. My favorite place to be is in my recliner with my tablet ready with a good, clean romance or mystery. I’m not sure what God wants me to do with the rest of my life(I’m 84) but will listen for His word for me in 2019. Prayers for your health, Virginia. I’m sure God has wonderful plans for you, and I’ll be interested to hear what your word for 2019 is, when or if one comes. What?! 2019 is coming…already?! Where did the year disappeared??? And 2018 was shorter than 2017, right? LOL, Natalya! Yep, this year was definitely shorter. At least, it must have been.! 6 books in one year? That seems like stress to me. Direction correction for me as well this year. In May my Word became ‘Restore’. After several years of actively advocating for seniors safety from abuse, God clearly spelled out it was time for me to Rest and Restore. . . health and abilities affected, I heeded Holy Spirit counsel. What 2019 will be remains to be disclosed and I’m committed to that disclosure as and when revealed. Grateful for God’s care! Love your writing, Autumn, and love Christmas stories – perfect combo ! Anticipation . . .
Oops, sorry for the delayed reply!